A long-term closure of the northeast 4th and Hill Street portal at Pershing Square starts next Monday, April 18, through January 2017. During the closure, crews will replace the escalators and re-grade the Metro plaza on that side of the station. In addition to escalator replacement, the closure will coincide with a longer-term project — the construction of a mixed-use development. 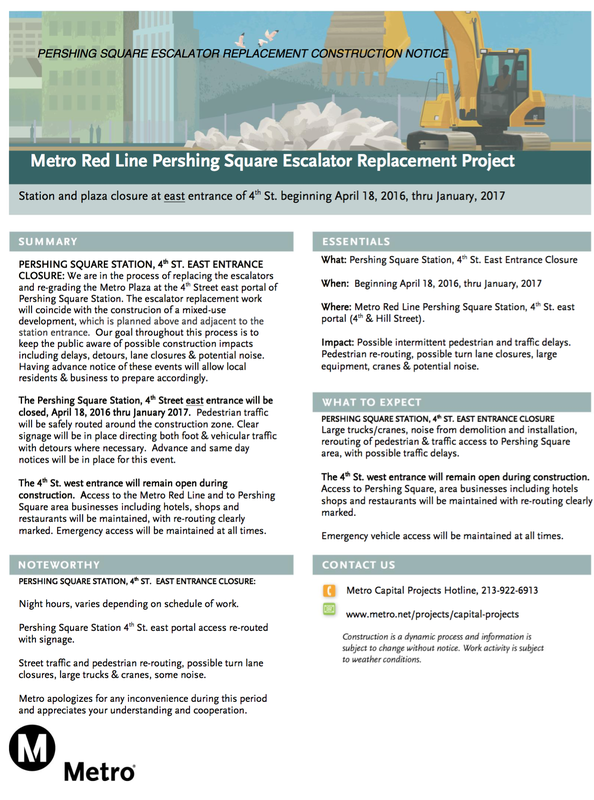 The 4th Street west entrance and 5th Street entrance to Pershing Square Station will remain open for use. Might Metro take advantage of this construction presence to make the North Entrance of Pershing Square Station ADA-compliant and install a Faregate? The fare control there is done entirely with turnstiles. The Pershing Square station has three portals: (1) at the northwest corner of Hill and 4th, (2) at the northeast corner of Hill and 4th, and (3) at the southeast corner of Hill and 5th. The abbreviation “NE” appears eight times in the construction notice, so I assumed (upon seeing it last week) that only the northeast portal was going to be closed, which would be just a minor inconvenience as there’s another portal across Hill Street. This Source story says “4th & Hill Street portal” (singular) in the title and “4th Street entrances” (plural) in the first sentence and ends up saying, “The entrance to Pershing Square from 5th and Hill will remain open for use,” so I’m left wondering whether both 4th Street portals are going to be closed, which would be a major inconvenience for Red and Purple Line riders going to the Grand Central Market, the California Plaza (which will be hosting concerts drawing up to 5,000 people two or three times a week throughout the summer), and Moca, or whether The Source just doesn’t know that there are three portals. I agree with your response. Once again, Metro puts its contractors ahead of its riders. I strongly urge all Metro riders to abandon Metro for the freedom of driving wherever you have to go. Quite aware that there are three entrances considering I used to live by that station and still frequent it when going to Grand Central Market. The portal in reference is the only one on 4th/Hill with a canopy. I am working to get updates from the project team — while both entrances on 4th/Hill will see closures for escalator replacement, it will not be at the same time, so I have made those corrections. There may be a revision of the construction notice later on with more specific details on replacement work as well as upcoming development construction that may affect foot traffic in that area.